If there's anything you've ever wanted to know about placing an order with Peter's of Kensington, with a bit of luck, the answer will be right here. "How long will it take me to receive my order?" Our dispatch times are generally between 1 and 3 working days. PLEASE NOTE: if you request changes to be made to your order after it’s been placed, it may delay the dispatch date. Small orders for just one item will often leave our warehouse very quickly. If you’d like to check the progress of your order, call the store on (02) 9662 1099 or use our live chat service. Make sure you've got your order number handy. "What if I change my mind about an order, or something I purchased arrives faulty or broken? What is Peter’s of Kensington’s returns policy?" We’ve put together a handy Returns Policy Page that explains how to return part of or your entire order. "What is your packaging made from?" So many people send us emails asking why we're still using plastic void fill when there are so many environmentally friendly options available. At Peter's of Kensington, we are fully committed to reducing our environmental impact. As such, we utilise a mixture of biodegradable and recyclable air pillows, and all of our cardboard boxes are made from recycled materials. "I've already placed an order, but I need to change it. Is this possible?" Adding more products to your order, subtracting products from your order or even cancelling your order completely is ok: provided your order has not been dispatched. If you’d like to make any changes to an existing order, it’s best not to send us an e-mail. The fastest way is to call during business hours on (02) 9662 1099 or use our live chat service and we’ll arrange it. Just keep in mind that, when adding products to your order, your order might take longer to process, and we might need to charge you extra postage. "If I place an order online, how can I pay for it?" You can pay for any online order using Visa, MasterCard, American Express, Chinese Union Pay, Diners Club, JCB, Discover, PayPal, AfterPay, ZipPay, Alipay, WeChat Pay and Peter's Gift Cards. We can also arrange for direct debit payments by phone (02) 9662 1099. "I need something fast. Can you arrange for an express delivery?" Forgotten an important event? Don’t worry. Find what you’d like to order on our site, call us on (02) 9662 1099 and ask for a quote for overnight delivery, or if in Sydney we may be able to give you a same day quote. You’ll have that all-important present on your doorstep in no time. You can use our website to track the progress of your order. Click on the "Order Tracking" link at the top of our website, and enter your order number. This will let you know if your order is still at our store, or whether it's with Australia Post, on its way to you. If you're concerned that your order is taking too long, just call us on (02) 9662 1099 or use our live chat service and we'll find out what's happening with your order. "I’ve got my order, and there’s a problem with it!" Sometimes things go wrong. Don’t worry, we’ll help you out. "How does an in-built TSA combination lock work?" 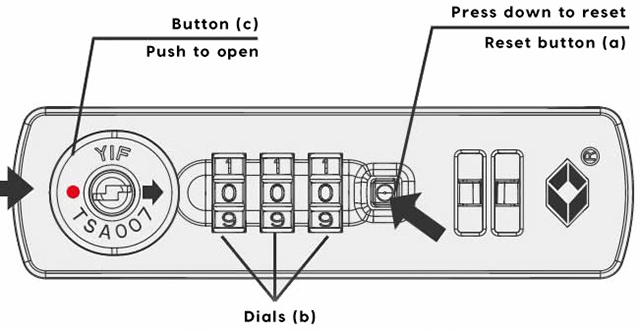 Whenever you purchase a piece of luggage that features an in-built TSA combination lock, the default combination to open your luggage will always be set to 0-0-0. Put the dials at their original numbers (0-0-0). Press down on the reset button with a small tool until a ‘click’ can be heard. Turn the dials to set your new combination e.g. 1-2-3, 9-8-7 etc. 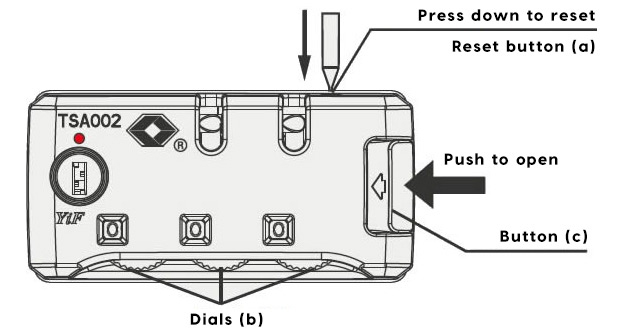 Push the large button towards the combination dials and reset button will ‘click’ and return to its original position. "I was in the middle of placing an order and something happened to my computer! How can I tell if my order went through?" If you’re having a few technical troubles, just call us on (02) 9662 1099 and we’ll help you through the ordering process. Ask to speak to our IT department. We’ll help you through every step of the ordering process. We offer shipping to New Zealand, the UK, America, Canada, Europe, China, Japan & Hong Kong. Click here to find out more. We also ship to Australia Post parcel lockers. "I need to buy a gift for someone, and I don’t know what to get." Check out our Gift Ideas page. "Does Peter's of Kensington sell gift cards?" Yes! Click here to have a look at our gift card page! You can buy gift cards in any denomination you like. They’re valid for 3 years, and they’re the ideal gift for someone special. "Does Peter's of Kensington offer a lay-by service?" We have added Afterpay and ZipPay as a payment option for our online orders. "I'm getting married! Does Peter's of Kensington offer a Bridal Registry service?" We do offer a Registry service. And it’s not just for brides and grooms – you can create a Gift Registry for any occasion you like. Click here to take a look. "Wait. You haven't answered my question yet!" For any urgent enquiries, please call the store on (02) 9662 1099.